Nearly 800 million people struggle with hunger worldwide. We have the knowledge, the tools and the data to lower this figure to 0 – but this can only happen if everyone has equal access to data. Access to research and data is crucial to feeding the world’s hungry. World leaders and the brightest minds in agriculture and data are currently in New York for the GODAN Summit 2016 to make agricultural and nutrition data free for farmers around the world. 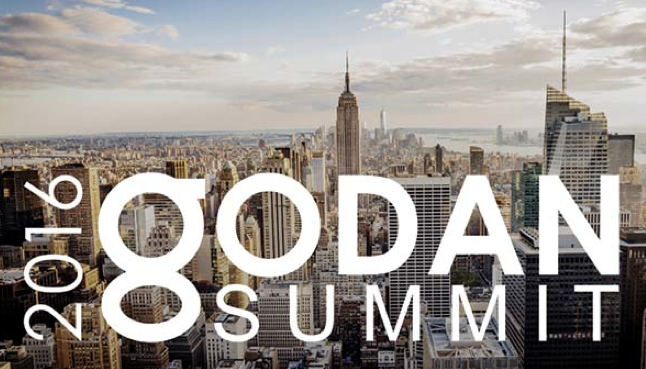 The largest-ever event dedicated to open data and agriculture, the GODAN summit will take place on the margins of the UN General Assembly in New York. The aim will be to urge world leaders to open their national datasets on agriculture and nutrition to help bring hunger around the world to an end. Experts from around the world have gathered to discuss opening vital data on agriculture and nutrition to millions who don’t have access. We are convinced that the solution to eliminating hunger lies within existing, but often unavailable, agriculture and nutrition data. The Global Open Data for Agriculture and Nutrition (GODAN) initiative is committed to closing this unacceptable hunger gap by making agriculture and nutrition data available, accessible and useable to everyone. Portions of the event will be LIVE webcast. So those interested can watch . Details are at the GODAN Summit 2016 website http://summit.godan.info Videos from the event will be posted on the GODAN YouTube Channel. The Global Open Data for Agriculture and Nutrition (GODAN) http://www.godan.info initiative was announced in 2013 and aims to bring countries together to harness the massive amounts of data to solve hunger problems, benefit farmers, and address consumer health issues. GODAN seeks to support global efforts to make agricultural and nutritionally relevant data available, accessible, and usable for unrestricted use worldwide. By empowering stakeholders and world leaders to enable action, GODAN works to unlock the data necessary to solve the challenge of global food insecurity. We need your help to help farmers get the data they need and help end hunger. We call on you to support this global action to get every government, non­-governmental, international and private sector organization to make agriculture and nutrition data available, accessible and usable. We look forward to your active support. Prof. Manoj Arora who is heading as Director (Vice Chancellor), PEC University of Technology Chandigarh and Professor of Civil Engineering, IIT Roorkee (on lien) where he is working as Professor in Remote Sensing in the department of Civil Engineering is the main force behind the establishment of OSGeo lab at PEC. He has also shared the good news that they now have partnered with Indian Railways to establish Kalpana Chawla Chair on Geospatial Technology at PEC. 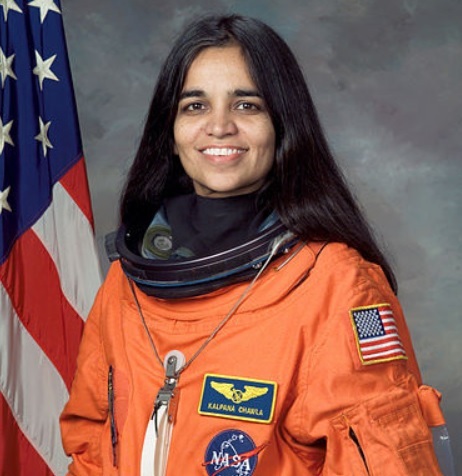 Kalpana Chawla  was an Indo-American astronaut and the first woman of Indian origin in space. She first flew on Space Shuttle Columbia in 1997 as a mission specialist and primary robotic arm operator. In 2003, Chawla was one of the seven crew members killed in the Space Shuttle Columbia disaster. She was a true global citizen working for the advancement of science for all, so it is fitting tribute that through PEC , one of our OSGeo labs will have chair in geospatial technologies established in her honour. I thank Dr Manoj Arora and other colleagues who have worked hard to make this possible and Indian Railways for funding this chair. Manoj has visited Nottingham University twice in recent time (though i couldnt meet him!) (June and Sept 2014 for a day each) as part of delegation from Chandigarh Region Innovation and Knowledge Cluster (CRIKC) http://crikc.puchd.ac.in . CRIKC is a cluster of 15 odd academic institutions and research institutions in Chandigarh with Vice Chancellor, Panjab University, as the Chairman. CRIKC has signed MoU with University of Nottingham to have academic collaboration in many different ways. 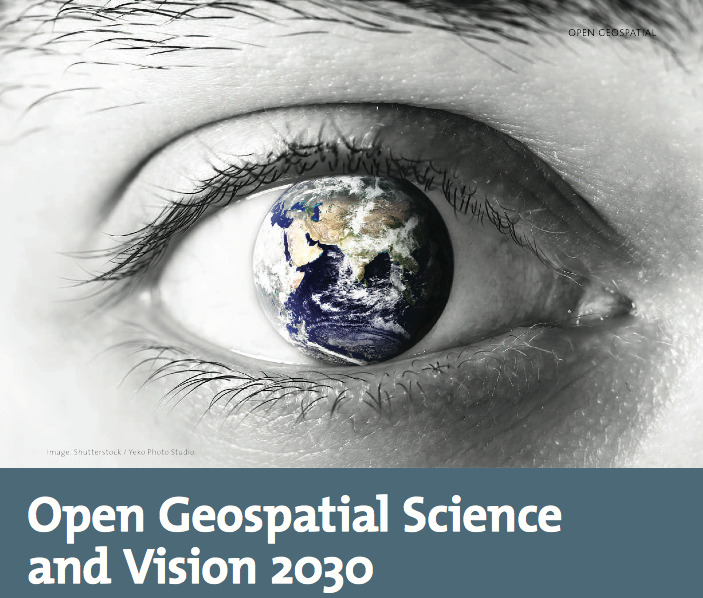 I can see many research synergies in open geospatial esp. in Opencitysmart research that we will be able to able to explore in the future. I have been invited to deliver a webinar by the Open Education community on 22 September, 2016 at 12.30PM – 1.30PM (UK time) and i would like to invite all interested to join. I will use this opportunity to share our Geo4All experiences with the wider education community and build more synergies. Over 20 years back , i was a student in Civil Engineering in India and by pure chance i came across a short article in a magazine in my college library on the amazing Geographic Information System that is used by Town Planners . That was the first time i heard about the wonderful technology called GIS! That time, there was no GIS where i studied but i was determined to get access to learn GIS . I still remember the struggles i went through to get access to GIS that time in India as there were very few universities who had GIS those days. I was very lucky as by God’s grace i got some amazing opportunities later to learn GIS. So now it is my duty that others also get opportunity to learn GIS . We do not have the money /sponsorship power as some vendors but we do have amazing people power like you all globally to make things happen. I thank you for your help in sharing Geo4All ideas. Ideas that starts from nothing are very powerful and keeps expanding exponentially . Next week, we have two meetings planned in the USA (one in Denver and one in New Mexico) where there is further opportunities to expand the discussions and ideas on Open Geospatial Science – Vision 2030  and how we can build synergies towards the vision of the UN 2030 Agenda for Sustainable Development for building a better world for all. Looking forward to working with you all on this. It is my great pleasure to introduce Nimalika Fernando as our GeoAmbassador. I am grateful for this opportunity of introducing some of our amazing colleagues from different parts of our world each month as our GeoAmbassadors and this has also helped me also to learn and get inspired by their amazing work and contributions for the wider community. Nimalika established the OSGeo lab at Sri Lanka Institute of Information Technology(SLIIT), Sri Lanka in 2014. Though I have not yet got the opportunity to meet Nimalika , I am amazed by her teaching and contributions she made. Nimalika Fernando was an academic attached to Sri Lanka Institute of Information Technology(SLIIT), Sri Lanka from 2001 -2016 and now she is a research student at Curtin University, Perth Australia. Nimalika has moved to geospatial domain in 2005 with her MSc project, without having any formal education in GIS . GIS became practically important to the country at that time as Sri Lanka was facing large planning issues after 2004 Tsunami with no much technological knowledge at hand. Dr. Waidyasekara, a GIS enthusiastic who was a senior academic at SLIIT that time proposed a web GIS for post disaster recovery management but the concept and technologies were entirely new to the country. Nimalika happened to inquire about free and open source approaches and MapServer and PostGIS as tools were the starting point of her GIS journey to learn web GIS. Her link with FOSS GIS continued ever since and she had started teaching what she had learned by experience and advocating the value of open source GIS to Sri Lankan community. She designed and delivered a module on web –GIS with Map Server in 2008 for postgraduate students at Postgraduate Institute of science , Peradeniya by invitation of the MSc course coordinator, Dr. Jagath Goonathilake , who had taken a very challenging decision that time to introduce open source GIS to his students , in a background where nobody have heard about such options available. 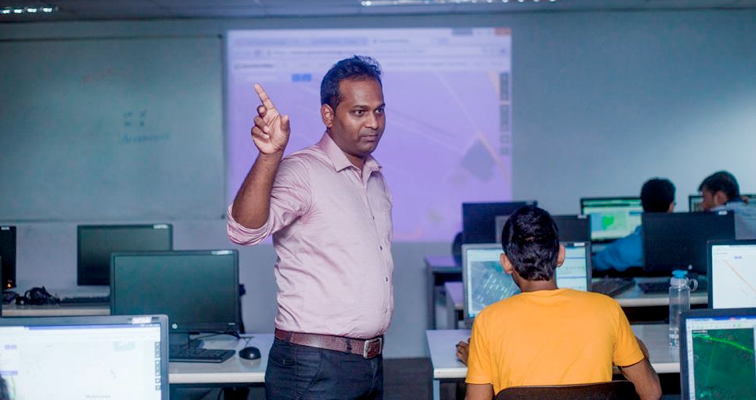 This module has opened Sri Lankan GIS professionals to open source GIS, a very new domain in Sri Lanka then and now it has become an established module where she still continue to be a teaching panel member. In 2009, she introduced a “Geographic Information Systems” module as an elective to undergraduate students of Faculty of IT, University of Moratuwa. The same module was introduced to Faculty of Computing, SLIIT in 2011 with more practical components. 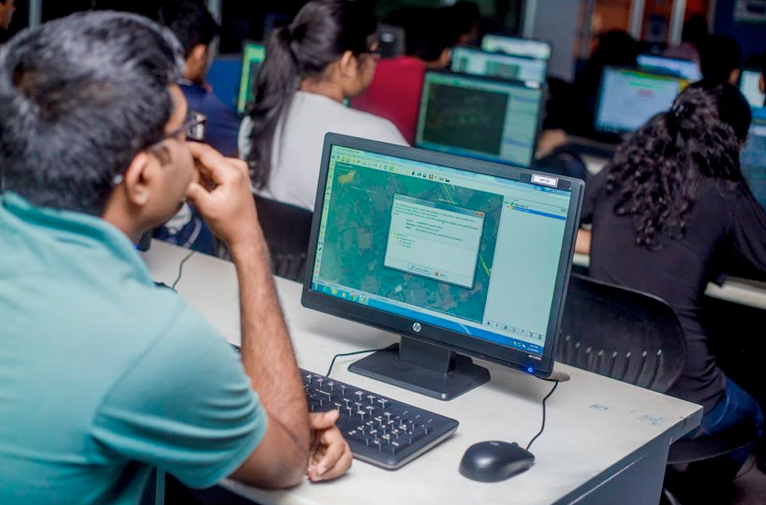 Both these modules provide a unique opportunity to Sri Lankan undergraduates having IT background to learn and experience geospatial domain. 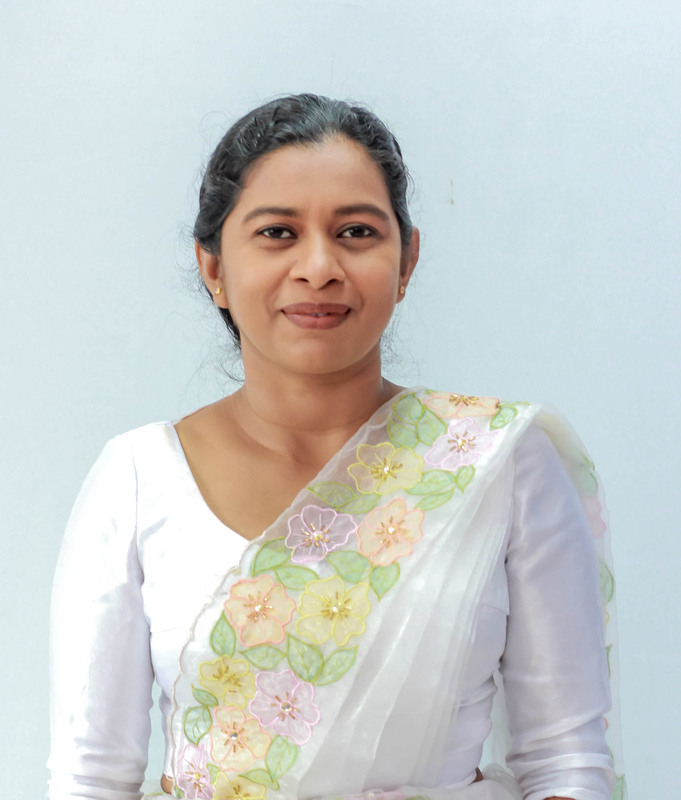 She has being mentoring and conducting guest lectures and seminars on open source GIS for Sri Lankan university students and public servants travelling around the country. She teaches tools such as MapServer, QGIS , PostGIS and OSM mapping to Sri Lankan community. She has being participating at GIS events worldwide and was presenting at FOSS4G 2009 Sydney, FOSS4G Asis 2014 Bangkok and FOSS4G 2015 Seoul. She assisted in organizing FOSS4G Asia 2014 Bangkok and Asia Special Track of FOSS4G 2015 Seoul. At SLIIT she acted as the advisor of Rotaract Club of SLIIT, FOSS Community of SLIIT , leader of the Geoinformatics & LBS research group and acted as a student counsellor from 2012 onwards. It was Dr. Yann Chamin who motivated to initiate the lab, who was introduced to Nimalika by Vivien Deparday, a keen GIS developer who regularly visit Sri Lanka and always keen in linking Sri Lankan community with the world community. The lab marked a milestone for GIS teaching and learning of SLIIT students and the whole community. An elective module , GIS is offered to SLIIT final year IT students via the lab , which became a very successful module where students are introduced to GIS concepts and tools. Many of them use the skills in their final year projects and professional life. They were trying to apply the local and personal context to land mark based path planning and developed a novel method for path planning using a weighted model. OSM data were used for the application. 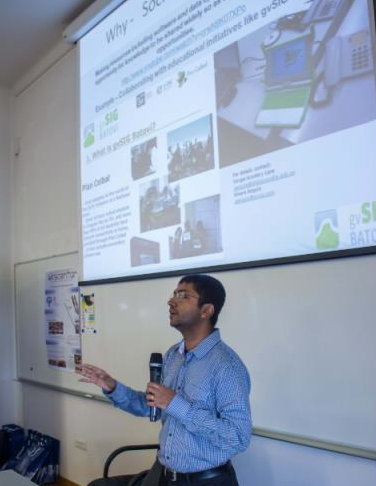 OSGeo Lab of SLIIT links students to industry opportunities. Until now two students of SLIIT had obtained valuable internships for GIS Programming in World Bank projects in Sri Lanka. The experience they obtain via this would be remarkable as they work directly under the supervision of core developers from the team. They work related to GeoNode based application development. 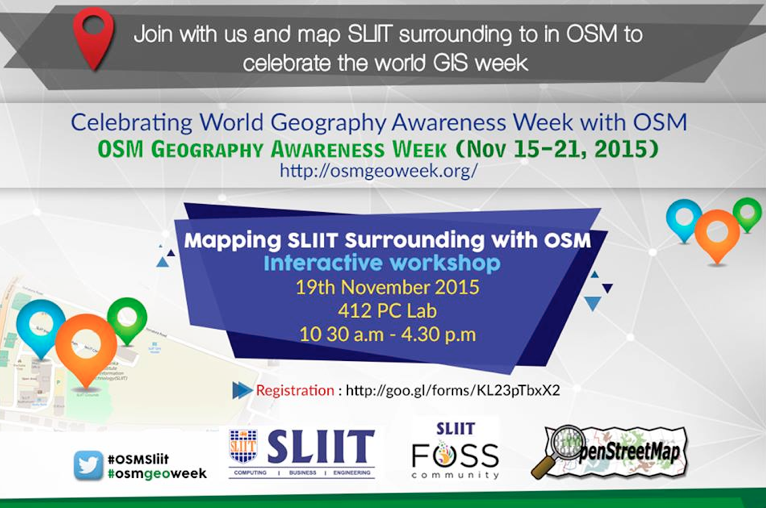 A workshop to celebrate the world geography awareness week is organized by the lab in 19th November 2016, linking with OSM Geography awareness week. 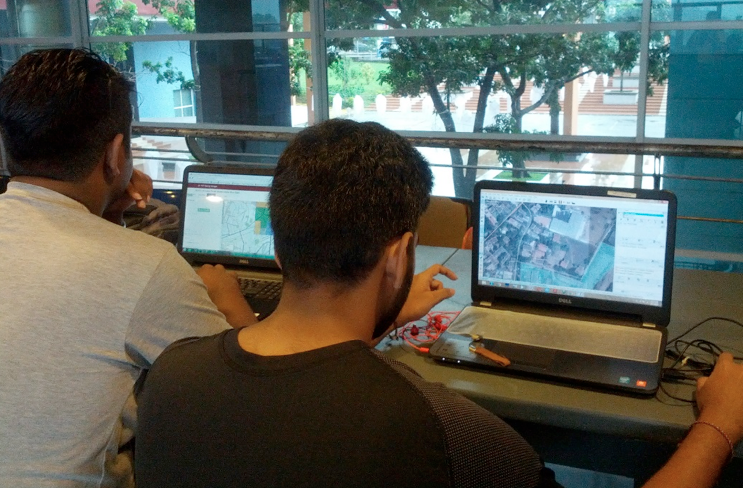 As an immediate response to heavy floods occurred in Sri Lanka in May 2016, Humanitarian OpenStreetMap Team (HOT) organized global mapping events to map flood affected areas. SLIIT OSGeo lab also took part of this and organized a Mapathon to support flood on 21st of May 2016. This was a unique event, organized within a day while the university is blocked by floods. 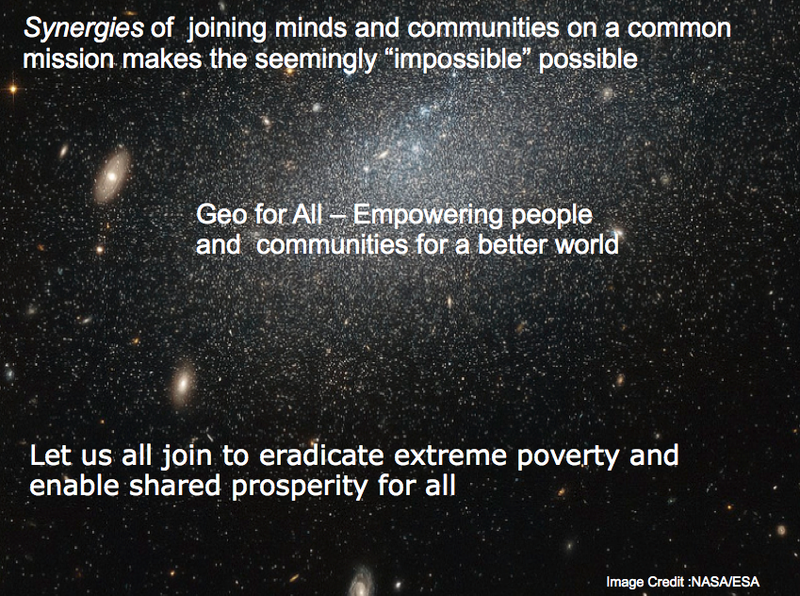 Geo for All is a worldwide movement that provides immediate benefit to the world. We aim to create openness in Geo Education for developing creative and open minds in students which is critical for building open innovation and contributes to building up Open Knowledge for the benefit of the whole society and for our future generations. We are proud to honour Nimalika as our GeoAmbassador and we are extremely grateful for her contributions to Geo for All. 20 years back many academics and educators (esp. in developing countries) struggled to start GIS courses for thier students and had to beg to vendors for some “free” licences .Now they dont need any “charity” from any vendors, as they are fully empowered and can start courses as they wish without any permissions from any vendor owners . We want academics globally to be fully empowered from now and give software as they wish to thier students education. By making free and open software and educational resources available for all has empowered academics and educators globally and brought down the “Iron Curtains” that some vendors have tried to create in education. Now no vendors can dictate terms to any academic or educator or student. We want academics to be in full control of education from now not any vendors. I would like to thank the OSGeo Live community for making available Version 10.0 of the OSGeo-Live GIS software collection that has been released at FOSS4G conference in Bonn, Germany – the annual global event of the Open Source Geospatial Foundation (OSGeo). OSGeo Live is an excellent resource for academics and educators around the world to teach geospatial science and give away the software for free to thier students thereby empowering them in the true sense. This excellent resource is made available to the global community thanks to the hardwork and selfless dedication of hundreds of volunteers (Developers, packagers, documenters and translators) in addition to thousands who have been involved in building the packaged software. Thank you all for making this possible. 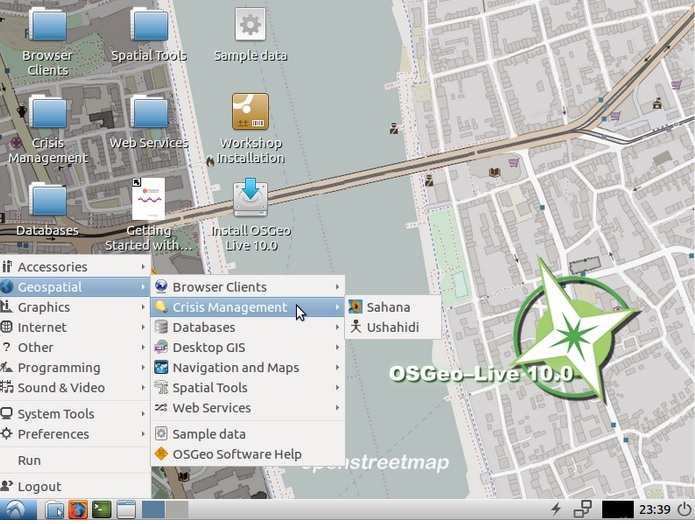 OSGeo-Live is a self-contained bootable DVD, USB flash drive and Virtual Machine, pre-installed with robust open source geospatial software, which can be trialled without installing anything. I request all colleagues globally to make use of opportunities like Geography Awareness Week (November 13 – 19, 2016) and other important Geography events like OSM Week 2016, GIS Day 2016 etc to spread Geo4All ideas and give away OSGeo Live DVD, USB to your colleagues and students so they dont have to buy any properitery GIS software and truly empowering them. By doing so, you are gifting millions of dollars of software to your students (if i may borrow some ideas from our properitery friends! 🙂 So go ahead and gift software for free from now at all Geography Awareness Week and all other key GIS events… We want all academics from now be the owners of the software and tools . You dont have to get permission from any properitery GIS vendor owners to start your courses or gift software to your students! It is my great pleasure to introduce our colleagues at OSGL of the Faculty of Geodesy, University of Zagreb, Croatia as our “Geo4All” lab of the month. I thank Dražen Tutić for providing all the background information and photos of the activities of the lab which is summarized in this article. 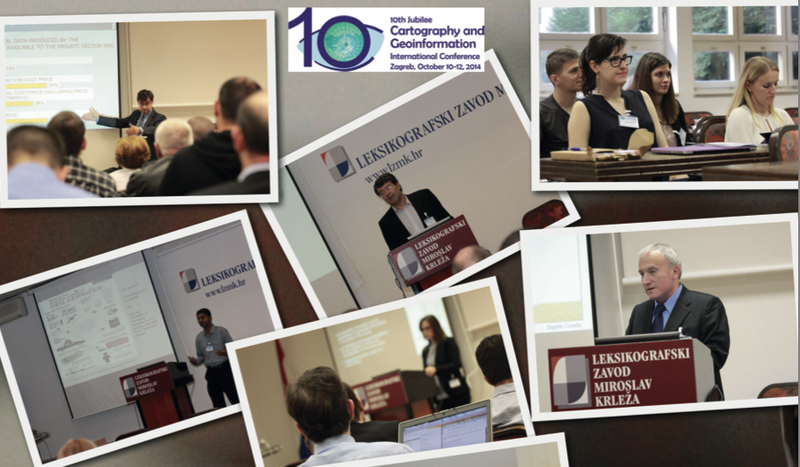 I first met Dražen Tutić , Miljenko Lapaine and other colleagues when I visited Zagreb for the 10th Jubilee Cartography and Geoinformation International conference for delivering a keynote presentation on “The Importance of Openness in Geospatial Education and Research”. That visit helped me to get a good understanding of the amazing work Dražen and colleagues were doing. The University of Zagreb (http://www.unizg.hr/ ) (established in 1669) is the oldest and biggest university in South-Eastern Europe. It consists of 33 faculties, academies and the Centre for Croatian Studies. With its comprehensive programmes and over 72,000 students it is the strongest teaching institution in Croatia. The Faculty of Geodesy, University of Zagreb (http://www.geof.unizg.hr ) is a public institution of higher education organizing and carrying out university studies, scientific and highly professional work in the scientific field of geodesy. The Faculty exists, as self-standing institution, since 1962. It is organized in three institutes (Geomatics, Cartography and Photogrammetry, Applied Geodesy), two laboratories (Laboratory for Measurements and Measuring Technology and Open Source Geospatial Laboratory) and the Observatory Hvar. The Faculty is the leading academic institution in geodesy and geoinformatics in Croatia and the region. It offers undergraduate, graduate, doctoral and specialist postgraduate study in geodesy and geoinformatics. Some 500 students are studying at the Faculty. Dražen Tutić kindly send us the background information and activities of the lab which is summarized below . The Faculty of Geodesy introduced substantial number of geoinformatics courses and modules to the study of geodesy with the introduction of Bologna process in 2005. 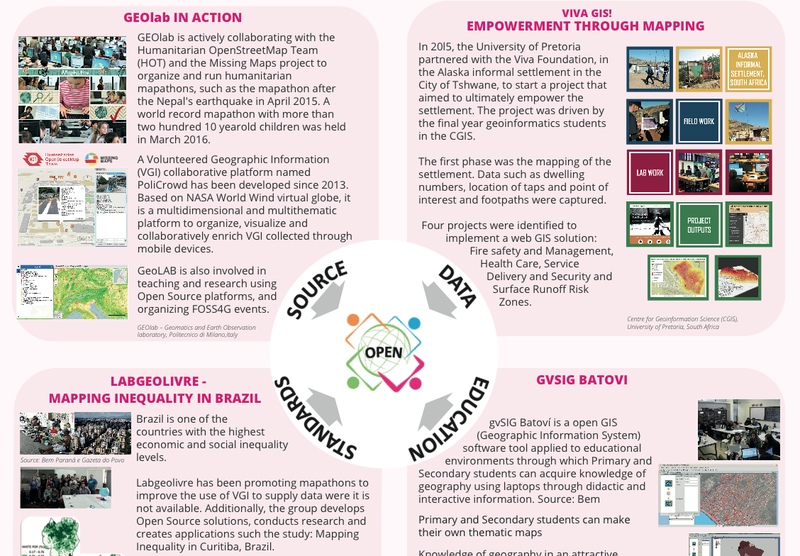 At first, students and teaching activities were supported by commercial software, but after more than 10 years, majority of teaching and student work is done using open source geospatial technologies such as QGIS, PostgreSQL+PostGIS, GRASS, PROJ4, Mapserver and OpenLayers. Students are also introduced to programming in several programming languages and are encouraged to solve problems by writing their own code.Nevertheless, we think that it is necessary to put more effort into bringing closer the open source technologies to students and teachers, as well as to our partners. So that was the primary activity of OSGL at the beginning. * to bring closer related professions and disciplines which can contribute to modern technologies in support spatial decision-making processes. Among the education materials we can highlight custom training materials for Linux and OSGeo programs published on the e-learning system, and expanded and localised training materials of QGIS GeoAcademy, module 104, Cartography using QGIS for Croatia and Montenegro. 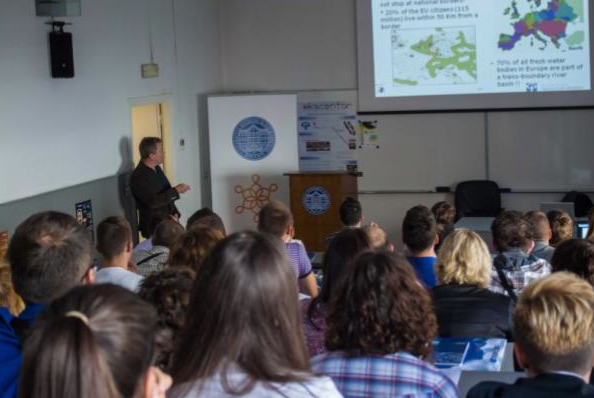 In collaboration with Students Council of Faculty of Geodesy and Croatian Cartographic Society we also organize or participate in educational events, e.g. OpenStreetMap Workshops for high school students or Humanitarian OpenStreetMap Team tasks. However, the special notion deserves students seminar Roles of Geodesy and Geoinformation in Sustainable Development where Suchith Anand participated as keynote speaker. Our open source developing efforts are mainly in the field of our expertise, i.e. cartography and map projections. We are active in PROJ4 project and we published two QGIS plugins (for cartographic line generalisation and visualisation of map projection distortions). Latest project which we found challenging but also rewarding is automatic generation of custom small scale maps from OpenStreetMap data. 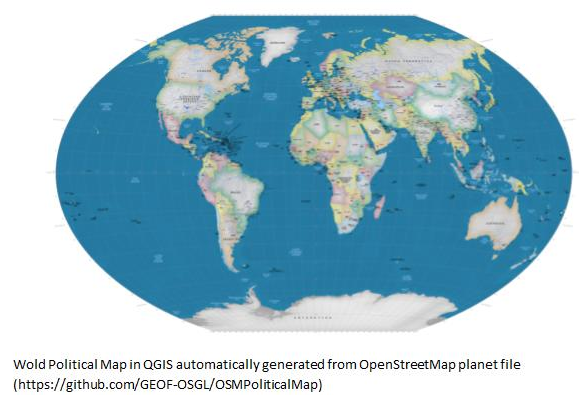 With an example of automatic generation of wall world political map it has been shown that open data and open technologies can be used for the most challenging tasks in cartography, namely cartographic generalisation. More info on our projects can be found on Github (https://github.com/GEOF-OSGL ). We thank Drazen and all colleagues and students at OSGL in Croatia for their contributions to the Geo4All initiative and look forward to working and building more collaborations with all interested on this education mission.